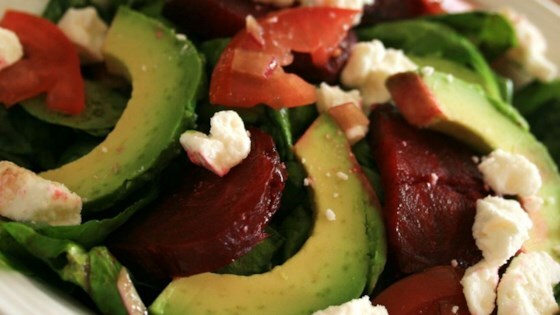 "Fresh roasted beets over a bed of baby spinach with tomatoes, avocados, onions and feta cheese drizzled with a balsamic dressing. You can cut this recipe in half for 4 servings, though it so good the next day too that I always make plenty." Place the beets into a large bowl, and drizzle with 1/4 cup olive oil, salt, and black pepper. Lay out 2 large squares of aluminum foil on a work surface, and place 3 beets onto the center of each sheet. Fold the aluminum foil into 2 envelopes, sealing the beets into the packets; place the packets into a baking dish. Bake in the preheated oven until tender, 1 to 1 1/2 hours. Check for tenderness after 1 hour by piercing a beet with a fork. Open the foil, and allow the beets to cool until they can be handled; peel, and slice. Lay out the spinach leaves on an attractive oblong-shaped serving platter. Sprinkle pieces of tomato and avocado over the spinach leaves, and top with chopped red onion. Lay the sliced warm beets over the salad, and top with crumbled feta cheese. Whisk together balsamic vinegar, 1/2 cup of olive oil, and Dijon mustard until smooth; pour over the salad to serve. Learn how to put a contemporary twist on the traditional Waldorf salad. Did not care for the dressing so I couldn't really enjoy the salad. Will make again but will use store bought dressing. I'm not even a big beet fan, but the combination of flavors was terrific. I made it for a luncheon and it was a hit.